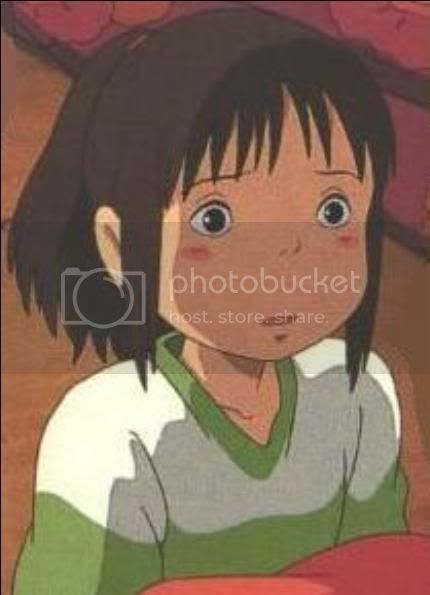 Chihiro Ogino is a human being from the movie Spirited Away by Hayao Miyazaki. Before her experience in the spirit world, Chihiro was a sullen, whiny and somewhat self-centered child, only caring about how something affected just her. Her family was relatively wealthy so Chihiro was used to things being just given to her instead of working for and earning them. Doing hard work, like chores, was a complete foreign concept. After the spirit world, Chihiro is a much-changed girl. She is much more optimistic, giving and more than willing to take on her share of work and responsibilities, as well as try new things. Where once she would have sympathized with her peers who were slacking off, now she is more apt to reprimand them for their lazy attitudes. Chihiro has also become more ecological, especially on the topic of pollution and destruction of rivers for urban development, and has developed a liking for collecting dragon-related memorabilia. When she was very young, Chihiro and her parents had a picnic by the Kohaku River. While playing near the river Chihiro lost her shoe, and when she tried to reach it she fell into the water. She should have drowned, but instead was carried safely to shore by the waves. After the incident at the Kohaku River Chihiro's life proceeded normally. Then, the year that she turned ten years old, Chihiro's father was transferred and the Ogino family had to move to a new home. Chihiro was very put out at having to leave everything familiar for a strange new place. On the way to their new home Chihiro's father took a wrong turn and the car dead-ended at the entrance to a mysterious tunnel. Despite Chihiro's pleas, her parents both decided to investigate. On the other side of a tunnel, after crossing a large meadow, they found a deserted town - what Chihiro's parents assumed to be an abandoned theme park. One of the restaurants had food set out, which Chihiro's parents promptly set to eating. While her parents ate, Chihiro explorered the town further. On a footbridge leading to a bathhouse she encountered a teenage boy who chased her off. She ran back to the restaurant where she had left her parents, only to discover pigs in their places. Terrified Chihiro ran through the city trying to find her parents, but when she reached the edge of the town found that the meadow had flooded. She watched as a riverboat brought numerous spirits across the water, but then panicked as she realized that she was fading away. Soon Chihiro was found by Haku, the boy that had chased her away earlier. He helped her become solid again, explaining that she was in the spirit world and that her parents had turned into pigs because the food they had eaten had been meant for the gods. The only way that Chihiro could save her parents would be to find work in the bathhouse. Haku helped Chihiro get into the bathhouse, where she was further aided by Kamaji the Boiler Man and Rin, one of the female workers. They sent Chihiro up to see Yubaba, the witch who ran the bathhouse. Despite Yubaba's continued refusal and threats against her and her parents, Chihiro kept insisting that the witch give her a job. Finally Yubaba relented and gave Chihiro a contract to sign - in exchange for working and living at the bathhouse, Chihiro had to sign over her name. Instead she was to be called "Sen". Sen was taken back down to the employees' floor of the bath house and introduced to the other workers by Haku, who was suddenly acting very cold and closed-off. He assigned her to Rin as an assistant, and although the older woman acted put out she quickly took Sen under her wing. The next morning Haku took Sen to visit her parents. He returned her old clothes to her, tucked inside of which was a goodbye card with Sen's true name on it. Haku told her to hang onto the card so that she wouldn't forget her real name, for if she did then she would truly belong to Yubaba and would never be able to help her parents. He admitted to her that he couldn't remember his true name, though he had tried. As she returned to the bathhouse, Sen saw Haku transform into a dragon and fly away. Sen's first day at work was rough; because she had never worked a day in her life, Sen was much slower and prone to mistakes than the other workers. Things only got worse when a stink spirit entered the bath house and was sent to the tub that Rin and Sen had been assigned to. All of the other workers gathered round to see how the new girl would handle such a guest. All told she handled it well, as Sen discovered a "thorn" in the stink spirit's side while bathing him. Realizing that things weren't what they seemed Yubaba conjured up a length of rope and had Sen tie it around the thorn while everyone else pulled. The tug-of-war released a torrent of garbage and junk that had been clogging up the spirit and concealing his true identity - a river spirit. Clean again, he grateful spirit gave Sen an emetic medicine ball as thanks before departing. The next morning Sen awoke to find the bath house in a frenzy. Sometime during the night a rich guest had arrived who was showering all of the workers with gold, and Rin told Sen to hurry down if she wanted to get some. Uninterested (and still shaken by a dream in which she couldn't recognize her parents) Sen stepped out on the balcony to get some air. In the distance she saw something flying towards the bath house. It was Haku, in his dragon form, being pursued by hundreds of paper birds. Sen followed the pursuit, ultimately sneaking into Yubaba's office where she met Yubaba's giant baby son, Boh. One of the paper birds that had attached itself to Sen's back was enchanted to transmit an image of Yubaba's twin sister, Zeniba. Zeniba accused Haku of stealing her gold seal and claimed that his life was forfeit for it. She also changed Boh and Yubaba's messenger bird into a mouse and a smaller bird, transforming Kashira (Yubaba's three servant heads) into Boh. Sen, Haku, Boh and Yu-Bird ended up in Kamaji's boiler room after Haku triggered the trap door in Yubaba's office, escaping from Zeniba. Down there Sen fed Haku half of the medicine ball, causing him to vomit up the seal as well as a small black slug. Kamaji identified the slug as something evil and on his orders Sen squashed it with her foot. With both foreign objects removed Haku returned to his human form but still remained comatose. Sen decided that the only way to help him was to journey to Zeniba's home in Swamp Bottom and return the seal. Impressed, Kamaji gave her the train tickets she'd need to get there. But before Sen could leave, there was one more thing she had to make right. The "rich guest" from earlier had gone insane, holing up in one of the best apartments and eating whatever he could get his hands on, including some of the staff. And the whole time, he kept asking for Sen. Yubaba identified the guest as a "no face" spirit, and Sen admitted to letting him into the bath house the previous night so that he could get out of the rain. Sen confronted No-Face, who tried to offer her gold. She gave him the other half of the medicine ball which resulted in No-Face regurgitating everything (and everyone) he had previously eaten. She then led No-Face out of the bathhouse realizing that the emotions there were driving him crazy. Outside Sen was met by Rin in a boat. Sen changed into her old clothes and Rin took her, Boh and Yu-Bird across the river to the train station. The three of them, as well as No-Face, boarded the train for Swamp Bottom. The journey to Swamp Bottom lasted long into the night, but Sen and her companions finally made it to Zeniba's house. There they found that Zeniba was much gentler and kinder than her sister; although still angry she accepted Sen's apology on Haku's behalf. When Zeniba realized that the protective spell on the seal was gone Sen confessed to having squashed the slug, only for Zeniba to explain that the slug had belonged to Yubaba, not to her; it was Yubaba's way of controlling Haku. Her seal returned, Zeniba served Sen and her friends tea and cakes, and insisted that Sen call her "Granny". Sen confessed her fears and difficulty in remembering her past life, and asked for Zeniba's help, only for Zeniba to kindly rebuff her and tell her that she has to get her memories back on her own. She then presented Sen with a hairband that Boh, No-Face and Yu-Bird had made with Zeniba's spinning wheel, with the promise that it would protect her because it was made by her friends. While Sen was at Zeniba's another visitor came calling, one that Zeniba asked the girl to open the door for. To her surprise it was Haku, in his dragon form and completely healed. Sen thanked Zeniba and told the kindly old witch her real name, Chihiro. Then she, Haku, Yu-Bird and Boh departed for the bath house (No-Face staying behind with Zeniba as her new assistant). During the flight back Chihiro flashed back to her early childhood and the incident at the Kohaku River. She told the story to Haku as well as her feelings that he had been the spirit of the Kohaku River, and he had been the one to save her from drowning that day. Chihiro's revelation broke Yubaba's control over Haku completely, and he thanked Chihiro for giving him his memory - and his name - back. Chihiro and Haku returned to the bathhouse to find Yubaba waiting for them with a group of pigs. Yubaba promised that she would release Chihiro from her contract if she could guess which of the pigs were her parents. When Chihiro correctly guessed that neither of her parents was in the group of pigs, her contract was destroyed. Haku explained that her parents had already crossed the meadow and were waiting for her near the entrance to the tunnel that led to her world. Chihiro said goodbye to Haku and crossed the meadow to join her parents. The Oginos emerged from the tunnel to find their car covered in dust and fallen leaves. Mr. and Mrs. Ogino had no memory of their time in the spirit world as pigs and so believed that someone was playing a practical joke on them. After cleaning out the car the family continued on their way to their new home. Not long after Chihiro had settled into her new home, she found herself in D'Ango Forest in the Digital World where she met her partner Kudamon. Reaching out through the D-Comms Chihiro contacted Takato Matsuda who came and took her back to Tetha. Once in Tetha Chihiro accepted Takato's offer for not only room and board above the Matsuda Bakery but employment there as well. While working at the bakery Chihiro fell victim to the Truth virus. Over the journals she admitted that she missed Haku. She also told Kudamon the story of her experiences in the spirit world, which had been at the forefront of her mind since she arrived in the Digital World. In the middle of dealing with the Truth virus Chihiro met Captain Jack Sparrow after he entered the bakery in search of bread. The pirate captain offered Chihiro a position on his pirate crew as galley cook. Although shocked by the job offer, Chihiro accepted and she and Kudamon left the bakery that very day. Once the rest of the crew of the Black Pearl was selected, the ship launched from Tetha and made its way to Axyori. Jack got up to his usual antics, which oddly seemed to amuse Chihiro and endear the captain to her. At one point, when Jack wound up in prison, Chihiro offered to bake a loaf of bread with a file hidden in it - if she knew how. After completing business in Axyori the crew of the Pearl returned to Tetha for some shore leave before moving on to their next port of call in Meria. The Pearl was docked in Tetha the day that Duskmon went on his rampage through the city. While Jack himself went to help in the fight, Chihiro and the rest of the crew worked to help get innocent civilians out of harm's way. And she could only watch helplessly as Jack was killed by Duskmon. Although devastated by Jack's death Chihiro dealt with it by burying herself in her work in the galley, making sure there was enough food for the crew and for the refugees who found themselves aboard ship as it made its way to safe port. A couple other crew members took it upon themselves to comfort the distraught girl. Her spirits were raised somewhat by the discovery of a note from Jack; it was addressed to Chihiro and read, I've always had faith in you. I'll return soon. As per pirate tradition, the crew of the Pearl attempted to return Jack's body to the sea. However the service was interrupted by the appearance of the sea goddess Calypso who took Jack's body. She decreed that if Jack were to be resurrected the Pearl and her crew would have to come to World's End and barter for his return. The Pearl docked briefly in Meria to let off anyone who had decided not to make the journey to World's End. Although she watched several former crew members disembark, Chihiro didn't join them. She was determined to live up to Jack's faith in her. Once their business in Meria was finished the Pearl sailed north for the Ancient Sea and World's End. After several days the Pearl arrived at World's End where Calpyso (in her guise as Tia Dalma) was waiting with Jack. As part of the agreement each crew member had to give up something of value as part of their payment for Jack's life. Chihiro chose her two most precious treasures: the hair ornament that her friends in the spirit world had woven for her and her note from Jack. But to her surprise Tia Dalma refused her offerings, saying that Jack had already paid for her himself. Instead she gave Chihiro a vial that held more than just sea water as a blessing. With Jack back amongst the living and the crew, Chihiro and the Pearl returned to Tetha and business proceeded as usual. In the month of March Tetha was the location for the Digital World's Festival of the Holy Beasts. Chihiro browsed through the bazaar in Ventus Square where she picked up a Thunder Kote with the intent on learning swordplay. She also reunited with Takato and Guilmon, and inquired after the bakery. Like many other members of the crew, Chihiro was concerned about Jack's odd (for him) behavior since returning from World's End. She was surprised when Jack invited her out for dinner one night during the festival. It was at dinner that Chihiro finally learned the price that Jack had paid Calypso for her. Jack told her that he had chosen her to be his successor, the next Pirate Lord of the Caribbean. Guided by an unknown feeling that told her she was on the right path, Chihiro accepted. The festival came to a close with the murder of Hououmon by Kurata. During the chaos the crew of the Pearl worked to help evacuate Tamers and other innocents. In the aftermath of the riots, the Pearl set out for Axyori and Meria to pick up supplies to help rebuild Tetha. Not long after the Pearl's return to Tetha, Chihiro found herself summoned in a dream to the Brethren Court, where she was introduced by Tia Dalma as Jack's successor as well as the future Pirate King. It was decreed that the other Pirate Lords would use the dreamstate to train Chihiro for her role, one by one. Afterwards a Brethren Court was formed in the Digital World, with each member from Jack's world selecting a Tamer as a representative/successor in the Digital World. In addition to her Pirate Lord training, Chihiro is also learning magic from Daisuke Niwa.